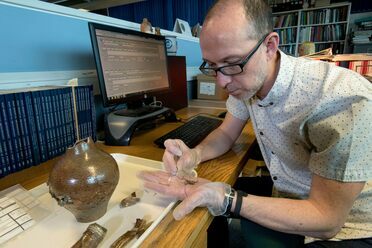 These distinctive artifacts are clues to how the Tunumiit people saw the world. The Tunumiit knew of the Danish missionaries and traders to the south, but very few had actually seen a European before. These East Greenlanders didn’t know it, but Holm’s arrival heralded the eventual end of a way of life going back a millennium. The meeting also generated some of the most well-known, unusual, and misunderstood artifacts from the Inuit world. Accounts describe Holm as a quiet, reserved, inquisitive man with a steadfastness hardened by years of naval service. His mission was exploratory, backed by the Danish Commission for the Direction of Geological and Geographical Investigations in Greenland, to gather as much information as possible about this unforgiving stretch of coastline, known for violent storms and impenetrable ice fields. There also appears to have been some interest among the Danish colonial administration at the time to see if any long-lost Norse colonies had somehow survived the centuries, hidden away along the northern reaches of the eastern coast. Holm had a keen appreciation for Inuit boat design—a good instinct in an environment only the locals understood well—and was using the traditional Inuit seal-skin umiaq, which allowed him and his crew to move safely and swiftly through dangerous fog and brash ice. In addition to three Europeans tasked with charting the terrain and making scientific observations of weather and geology, the crew was made up of about 30 Greenlanders from the south, who navigated, rowed, did the heavy lifting, and provided a steady diet of seal meat. A few were on hand to act as translators and missionaries as well. 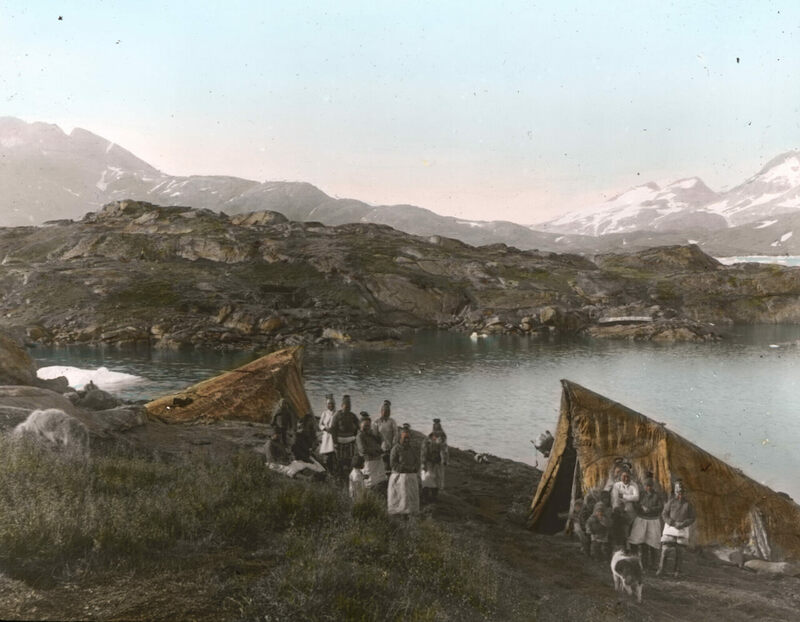 After Holm arrived in Ammassalik, today a town known as Tasiilaq, it was clear that the coming winter would prohibit safe passage back south, so the expedition decided to settle in for the next few months. This layover gave Holm the time he wanted to build relationships, as well as document the customs, language, and stories of the Tunumiit. Trade of goods is the currency of goodwill in many of these cultural exchanges, so Holm had brought European ironware, fabric, tobacco, and beads, which he bartered for anything and everything he could get his hands on. By the end of the winter, he had collected about 500 objects, from traditional clothing, hunting and fishing gear, and furnishings, to toys, magical talismans, masks, and ritual objects. To this day, much of the knowledge of traditional East Greenlandic art and handicrafts is informed by this collection. At the same time, Holm was focused on mapping the coast and filling huge gaps in knowledge of the coastline’s geography. This was a foreign practice to the Tunumiit, who had a different way of seeing the world. For these seafaring people, geographic knowledge was something remembered and shared through stories and conversations of travels and hunting. “The drawing of charts and maps,” Holm wrote, “was of course quite unknown to the people of [Ammassalik], but I have often seen how clever they were as soon as they grasped the idea of our charts. A native from Sermelik, called Angmagainak, who had never had a pencil in his hand and had only once visited the East coast, drew a fine chart for me covering the whole distance from Tingmiarniut to Sermiligak, about 280 miles.” They also provided him with incredibly detailed descriptions of terrain, flora and fauna, and, in some cases, local weather patterns and lunar and solar cycles. To pass some of this knowledge on to the curious, acquisitive Holm, one hunter presented him with a set of unusual maps that have been, by turns, overlooked, discounted, misunderstood, and, eventually, admired. One carving, 5.5 inches in length, is highly detailed, embedded with all sorts of information and place names for the fjords above and beyond the 65th parallel. It even indicates locations where a traveler would need to carry his kayak overland to get to the next fjord. Another carving measures a little over 8.5 inches long and depicts a specific chain of islands along the coast, connected by narrow stems. These two maps could be placed next to one another to demonstrate the relative positions of the islands along the coast. A third, smaller map was also commissioned by Holm and shows the fjords stretching from Sermiligaaq to Kangerlussuatsiaq and includes valleys, shores, and inlets farther inland. Holm never actually traveled through the regions represented by the maps, but they helped him get a larger understanding of the local geography. Remarkable though the maps are in both craft and the information they carry, they didn’t garner much attention when they were first brought back to Denmark. They were seen as just curiosities in his collection—but that quickly changed and they became a source of controversy. Some contemporaries of Holm doubted that Inuit people were capable of producing these types of maps, and that they were just the result of mimicry—classic Eurocentrism. In 1886, one Mr. Hansen-Blangsted argued in the French Minutes of the Meetings of the Geographical Society and the Central Commission that it was highly improbable that an “Eskimo” could possess the mental faculties to “invent” a three-dimensional wooden map. It was much more logical, he posited, that some shipwrecked European sailor taught the practice to the Tunumiit hunter—conveniently ignoring, of course, that no Western seafaring tradition had ever produced maps like this. Holm disputed Hansen-Blangsted’s racist claims and jumped in to defend the skill, memory, and intellectual capacity of the East Greenlanders he had gotten to know. A century later, the carvings have proven to be remarkable time capsules that capture the perception of the land and sea—alive and with depth—through the eyes of an East Greenlander at the moment of first contact with the Western world. The maps show how the Tunumiit cognitively organized their world, and have captured the imaginations of map enthusiasts around the world for over half a century. But as time passes the maps have acquired a new mythology that doesn’t quite suit them. Anecdotal descriptions of the maps online today compare them to some sort of archaic, ruggedized handheld GPS device: waterproof, small enough to fit inside a mitten, and naturally buoyant. It’s easy to picture a lonely seal hunter in his kayak using the map to navigate through an archipelago by the light of the moon. But this is how we use modern maps, as roadside companions, and suggesting that the Tunumiit used them the same way is nearly as Eurocentric as Hansen-Blangsted’s dismissal. There is, in fact, no ethnographic or historical evidence that carved wooden maps were ever used by any Inuit peoples for navigation in open water, and there are no other similar wooden maps like these found in any collection of Inuit material anywhere else in the world. But woodcarving was a common activity among the Tunumiit and Holm mentions that carving maps was not out of the ordinary. The Inuit people have used carvings in a certain way—to accompany stories and illustrate important information about people, places, and things. A wooden relief map, would have functioned as a storytelling device, like a drawing in the sand or snow, that could be discarded after the story was told. As geographer Robert Rundstum has noted, in Inuit tradition, the act of making a map was frequently much more important than the finished map itself. The real map always exists in one’s head. Though the maps themselves are unique, the sentiments and view of the world they represent were universal to the culture that made them. As storytelling devices, the Ammassalik maps now have a new chapter. In 2019, Carnegie Mellon University will send a laser-etched image of one of the maps to the Moon as part of the MoonArk project. Once assembled, the capsule will comprise a repository of art, science, and technology that weaves a narrative of human life on Earth. Kunit’s map will become part of a much larger story that immortalizes the creative genius and aspirations of mankind. The maps and the ark are serving the same purpose—to help us understand our own blind spots and reorient our understanding of the past and our relationships with one another. The Hunt-Lenox Globe is significant in so many ways.